What [Reformation thought] meant in practice is that the “spiritual disciplines” moved out of the monastery into secular life. Celibacy became faithfulness in marriage. Poverty became thrift and hard work. Obedience became submission to the law. Most important, prayer, meditation, and worship – while still central to every Christian’s vocation in the Church – also moved into the family and the workplace. The “star” of the book is a Lutheran philosopher of whom (I have to admit) I’d never heard – Johann Georg Hamann (1730-88). Goethe, we’re told, called Hamann “the brightest mind of his day.” A convert from Enlightenment thinking, Hamann deconstructed rationalism and insisted that reason was useless and destructive when separated from faith. According to the authors, he anticipated postmodernism in his critique of autonomous reason. He may, they suggest, have been the father of that linguistic analysis which so dominates modern philosophy. But for him this line of thought led, not to absurdity and despair, but to trust in Jesus Christ, His Word, and His Church. 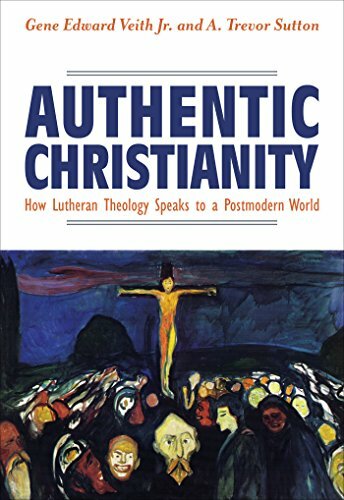 Veith and Sutton go on to analyze the (self-destructive) thinking of the modern world, and they explain how Lutheran theology answers the inherent questions of our time and fills basic human spiritual needs. The book works itself out as a systematic apologetic for Lutheranism, aimed at modern readers. If you’re looking for a stable church home, you could do far worse than reading this fresh and interesting book. Recommended. Gene Edward Veith at Cranach links to an article by Chad Bird on how fiction brought him to Christian faith. Unbeknownst to me at the time, however, something else was happening. The God against whom I had rebelled, and from whom I was fleeing, began to use these very works of fiction to beckon me home. As it turned out, the novels in which I had sought escape, became part of the means whereby the Lord rescued me from my own death.